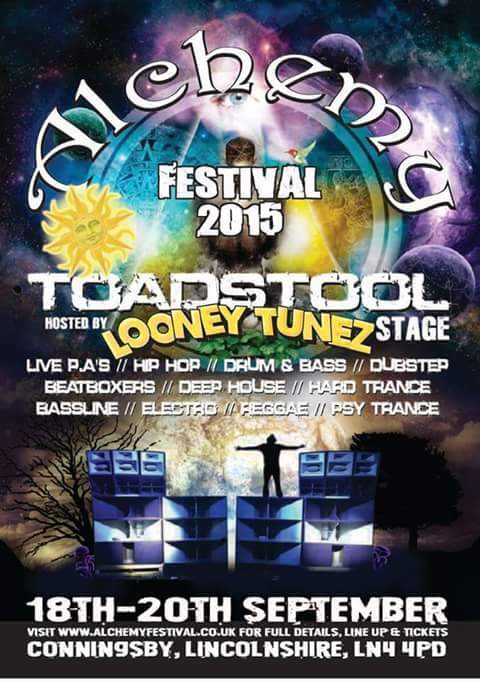 Alchemy is a family friendly music and entertainment festival set in a wildlife reserve in Lincolnshire. It is totally non-corporate, non-sponsored and non-commercial – and the organisers plan for it to stay that way. It runs as close to the Autumnal equinox as possible to fit with the ethos of Alchemy. The event is designed to provide a weekend of fun and entertainment at a reasonable cost in an environment that is similar to the old style of festival and, over the last few years, it has developed a reputation as such. In an interview it was particularly mentioned by Nick Turner (Hawkwind et al) as being an old style event. All costs on site are controlled by the organisers to be close to high street prices as possible. All entertainments, including a wide range of workshops for all ages, walkabout entertainers, fire pits, fire shows, circus performers, and lots, lots more are either free or reasonably priced. There are no restrictions on people bringing their own food and drink into the event – although we’d like you to buy from on-site traders – it is just required that no glass is brought onto site. The music is a real mix and organisers are sure that there is something for everyone including kids and families. There are now 8 stages in total, at least one being Solar powered and another Pedal powered, these are all running throughout the licensed times for the event, and play host to over 100 bands and DJs. Past acts have included RDF, Zion Train, Back to the Planet, Nick Turner and the Outriders of the Apocalypse to name but a few.